ERNEST DEZENTJE | Geringer Art, Ltd.
Ernest Dezentjé, who was born in Jatinegara, Jakarta in 1885, is often associated with the early “Indonesian School” of painting. He was largely a self-taught artist of mixed parentage who took up painting at the age of 31. He was a member of the Bataviasche Kunstkring, with whom he exhibited, and he also had solo exhibitions in Jakarta in 1936, 1937, 1938 and 1939. After WW II he became an Indonesian citizen. Known mainly as a landscape artist, Dezentjé worked primarily in Indonesia, but also in Sumatra and Batavia. Dezentje taught several artists, and trained his adopted son Djupriany as a painter. 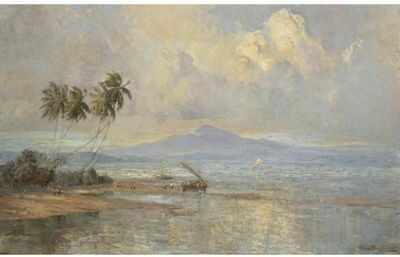 As many Indonesian artists adopted more avant-garde styles some accused of painting Dezentjé of painting “tasteless, stereotypical” tropical scenes.